The other day I woke up from a recurring nightmare that I have that’s somewhat based on reality. In my dream, it’s minutes before a big party with all of my friends and family. Chicken wings are on the menu – there’s a reason I keep seeing chicken wings labelled as party wings after all. I put the wings in the oven at 3:00 and set the timer. All of a sudden there’s smoke pouring out the the oven and the timer’s flashing 13:00. I’m worried about smoke inhalation, the house burning down and whether or not the chicken wings will be salvageable. I must’ve been pretty deep into it because Mike shook me awake and asked if I was having a nightmare. I was whimpering in my sleep. Sounds absurd, I know. And the thing is I haven’t even burnt chicken wings before. What has happened to me, and still makes me cringe at my stupidity is my flimsy understanding of the 24 hour clock. I must have been daydreaming when we covered that section in grade 2 math because I had a serious epic fail while I was in university. It was during finals. I checked my exam schedule and saw that it was set for 3 pm. I showed up 15 minutes early (because I’m conscientious like that!) and paid a visit to the restroom. Inside I saw one of my fellow classmates washing their hands. Girl: Hey Steph, you finished the test pretty quick, as usual. What’d you think? Me: Fast? Huh, what do you mean what did I think? Me (it starts on dawn on me that something is terribly, terribly wrong): But it’s at 3!! Girl (with a look of EXTREME pity): The test was scheduled at 13:00. You know, 1 pm? Seriously, my stomach dropped. I felt like a complete and utter idiot. Long story short, I read the exam schedule wrong. I’m a horrible Asian. I don’t have a special relationship with numbers. Math and, heck, even clocks, are my mortal enemies. Luckily my prof took pity on me and let me take the exam. My crazy face, complete with crying, must’ve convinced her I was telling the truth. I took the text, still feeling like an idiot. But, I did get an A! 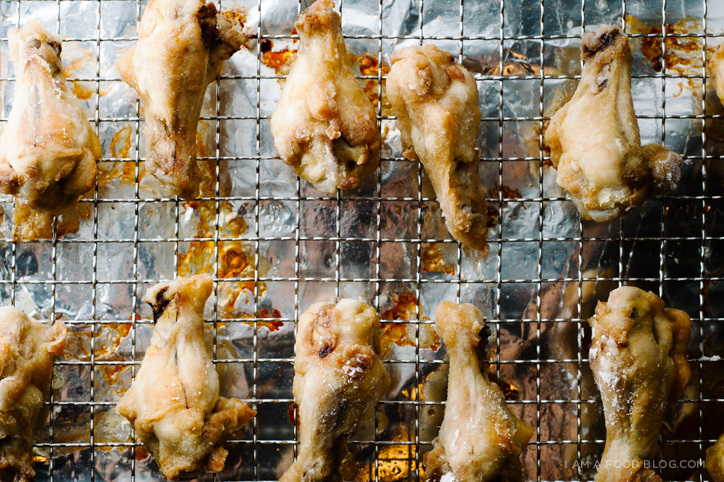 If you’ve had a nightmare, about chicken wings or math, these crispy oven baked wings will make you feel better. As much as I LOVE deep fried chicken wings, sometimes I don’t want to break out the oil. The answer: the oven. 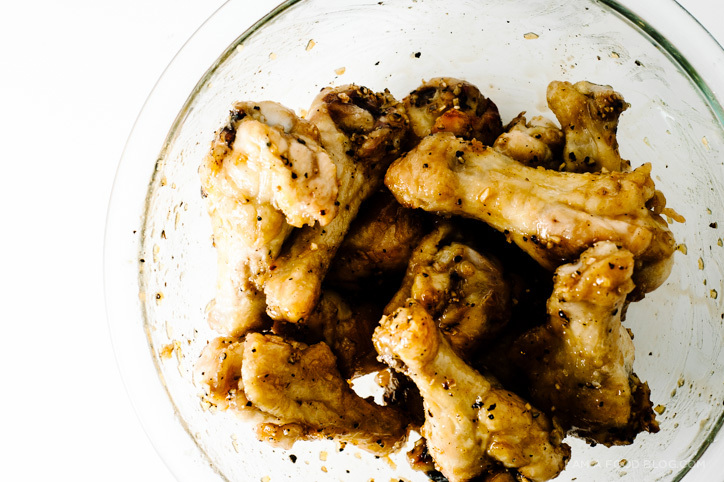 You can make crispy wings in less than an hour, most of it hands off. The crunch is not as extreme as it is when you deep fry, but the wings are still delightfully, deliciously light and crispy. And the glaze: who doesn’t love honey, garlic and soy? Sticky, sweet, garlicky and GOOD. You are six ingredients away from deliciousness. If you have the foresight, lay your chicken wing sections to dry out the skin. 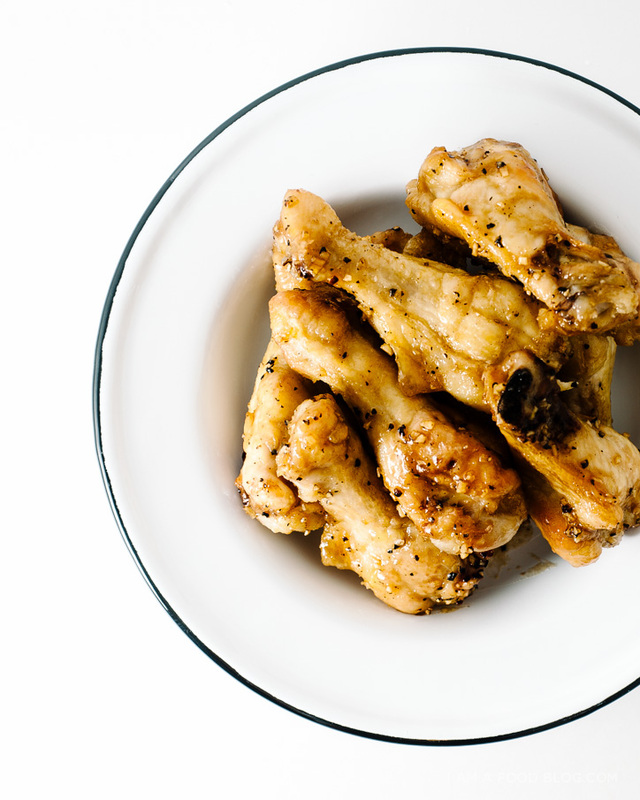 If you are in need of chicken wings RIGHT NOW, pat your wings as dry as you can with paper towels and let them dry out while you’re preheating the oven to 400°F. Set a wire rack inside a lined rimmed baking sheet. Toss the chicken wings in the potato starch and shake off the excess. 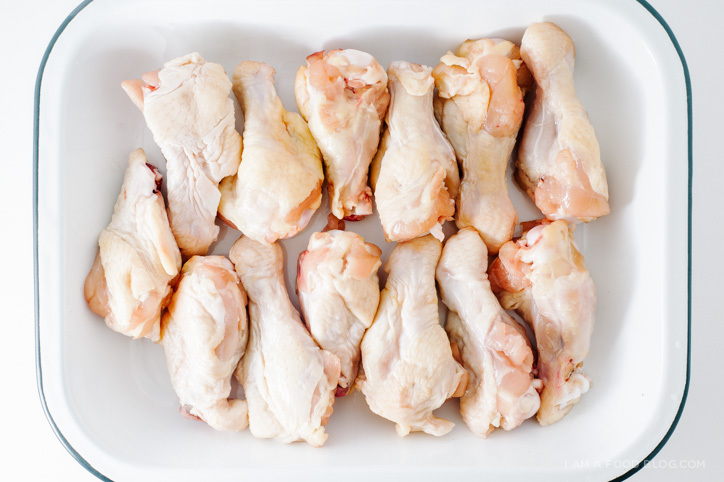 Lay out the chicken on your prepared rack, leaving plenty of space between wings. Bake for 45 minutes, until cooked through and crispy, flipping once. When there’s 2-5 minutes left on your timer, heat up the honey, soy and garlic over medium heat until bubbly and thick. 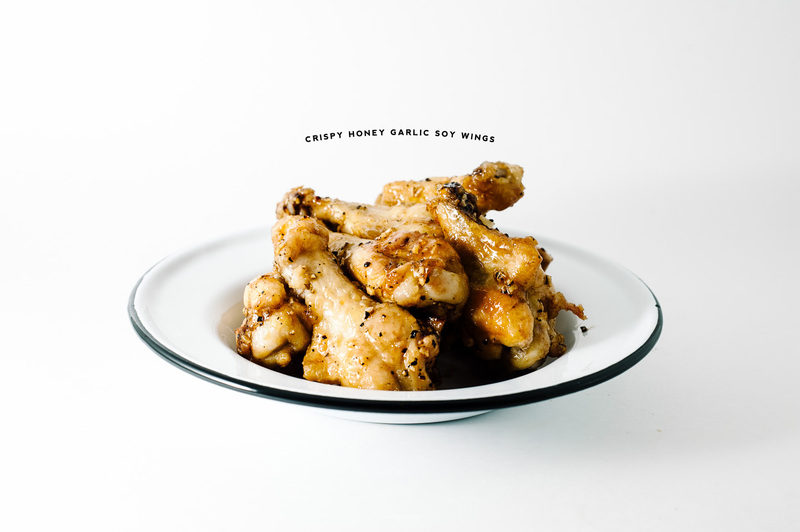 Remove the wings from the rack, place in a bowl and toss with the honey soy sauce. Enjoy immediately. there’s a dive bar in my town that has the BEST wings, but i have to refrain from going there all the time because i’m sure they are super fried and bad for me! i love the idea of baking wings. i will definitely be trying these soon. also, sorry about your nightmares, they are the worst!!!! i wonder it means…??!!! These sound delish! I’ve had some strange dreams too. Last week I dreamt that I had won the Lay’s potato chip contest flavor (and $1 million dollars)–sorta wish that had been true, lol! PS. 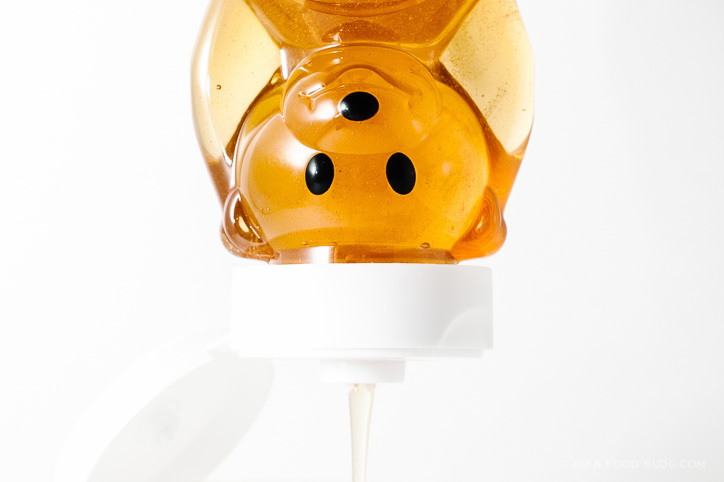 I love that honey bear picture, too cute. I constantly have nightmares about finding out I didn’t take a class in college so turns out I am not graduated yet and I have to go back! Ironically something similar to that did happen in real life (albeit less dramatic). A teacher forgot to enroll me for one seminar I actually did take so I was missing the class for my transcript and I needed it to graduate. They ended up enrolling me in a summer class to compensate for that missing credit but it was scary to think I was all done and see one missing class in red on my transcript print out! Also, I really need to make wings. We always want to make more budget-friendly (but still delicious-mouth-friendly) dinners and wings would be perfect. I can totally relate to having school related nightmares!! I still have nightmares about being in the school play and forgetting all of my lines when I was on stage. And then I have nightmares about not finishing school projects on time and things like that – and I’m 31!! I wonder if this will ever stop. . . :) These sound delicious!! That being said, thanks for the laugh. Your account of untimeliness really is cute! I used to have a huge problem grasping the concept of time when I was young. But with regards to nightmares, I always have this recurring dream that I’m late for the school bus and frantically dressing (I haven’t been in school for over 15 years!). Oh and that honey bear pic. LOVE. Haha oh NOOO Steph!! That test story makes me want to hug you through the screen!!! Even if it happened years and years ago and even if you got an A years and years ago. My stomach dropped just reading it. Oyyy. May I ask about the potato starch? I’ve used tapioca starch before when frying chicken wings (works GREAT), but haven’t thought of using tapioca (or potato in this case) while baking. Of course I haven’t used potato starch at all yet. Does it help the wings to get crispier? I like using potato starch because it does give it a bit of extra crispiness, but I haven’t done a side-by-side comparison with tapioca. Tapioca starch would give the same level of crispiness I think so if it’s what you have in your pantry, go for it! Would cornstarch or tapioca starch work as a substitute? The wings look fabulous by the way, and as someone who is hesitant about deep-frying, this recipe looks like the perfect solution! I love your photos, especially the honey bear one!! As good as these sound as is… a tsp (or 2) of Sambal Olek (or Sriracha) would satisfy Chileheads like me. I made these wings last week. I salted and peppered the wings before I tossed them in the potato starch as I have tasted chicken that hasn’t been salted before cooking and it has no taste. I had to up the temperature to 450 at the half-way point because there wasn’t much crisping or browning going on. I also added about 1/8 t. of harissa powder to the sauce as I thought it was too sweet and could use a little heat. This worked well. The wings turned out very tasty, but next time I will put some non-stick spray on the rack (the wings stuck to the rack and were hard to turn) and cook at 425 for 45 minutes. 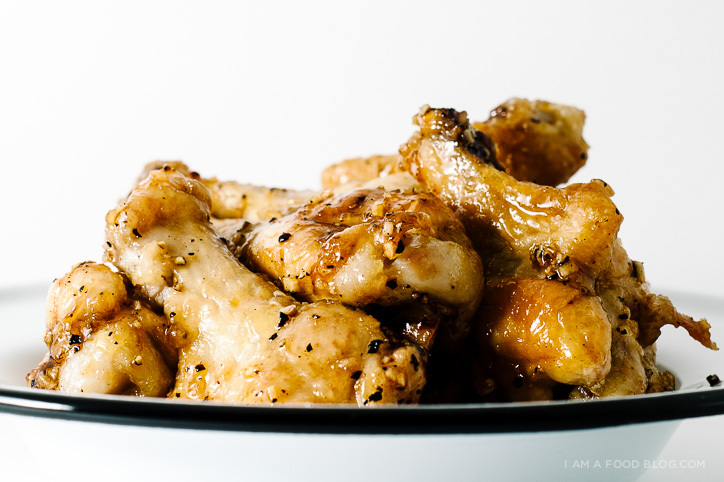 These wings look so tasty as do the rest of your recipes!! I plan on making these wings this week, but I don’t have potato starch. Could I use corn starch instead? And if so, would it be the same amount? yes, cornstarch would work as well! What if I don’t have a baking rack, what should I do. You could try it directly on foil or parchment paper, but my thoughts are that they would stick. I think spraying foil with non-stick cooking spray might help. But the reason for the rack is so that the wings get crispy on all sides – the rack lifts gives them more surface area for the hot air to circulate. This looks like a great dish! and my family loves chicken. Thank you for the recipe! Hi! Can you post a link to the wire rack you use? (And maybe give a brief review – is it sturdy? Does it clean up easily?) I’ve been wanting one for a while and just haven’t settled on anything yet. Thanks! this particular rack is from macy’s, the martha collection. (here’s the link.) i’d say that it’s fairly sturdy, but it does need a good scrub after use. i have put it in the dish washer though and it comes out clean and hasn’t had any issues with rusting. hope that helps! Hey Stephanie! I didn’t have potato starch so I just used cornstarch, and the texture isn’t amazing. Do you ever have issues with crispness or a slightly powdery feel? Or should I really just look into some potato starch and let it amaze me? cornstarch has the potential to work as well, but i would definitely try to shake off as much excess as possible. essentially you don’t want to see any excess powder after they come out of the oven. hope that helps! I am so gonna try it! Regular soy sauce or sweet soy sauce? I am a big fan of garlic. Looks yummy, I would like to use chicken legs instead not chicken wing. What do you think?